In its recently published report on global beverage packaging market, Future Market Insights forecasts a fairly fragmentized competitive landscape, with key five players holding merely 22 percent of the total market share of the beverage packaging market—including, Crown Holdings, Inc., Ball Corporation, Owens-Illinois, Inc., Ardagh Group S.A, and Orora Packaging Australia Pvt Ltd. The beverage packaging market is dominated by a few large global players and many small to medium-sized national and regional companies. Beverage packaging innovations have allowed the key players in the beverage packaging market to remain more competitive, translating into a wide variety of consumer products. 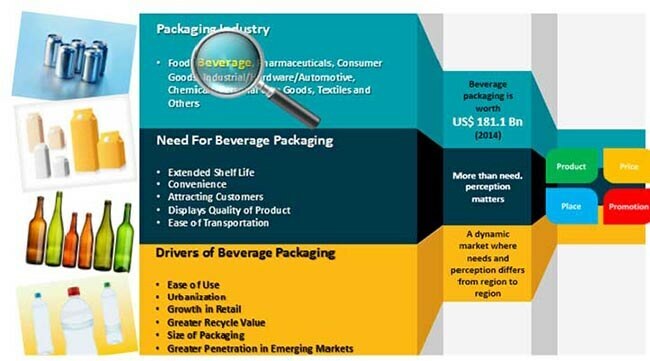 Beverage packaging demand is at an all-time high, and with the increasing penetration of packaged drinking format in emerging economies, the competition is expected to get stiffer in the beverage packaging market. Owing to its significant impact on the environment, beverage packaging manufacturers are placed under immense pressure to reduce the amount of materials used for beverage packaging. Moreover, to remain competitive, key players in the beverage packaging market are projected to make investments in equipment and process improvement—specifically designed to reduce waste and deliver lower basis-weight materials. Moreover, recycling equipment and extrusion technologies are likely to have a significant impact on scrap and basis weight, driving the sustainability factor in beverage packaging. For instance, as per New York City Department of Sanitation recycling standards, environmentally sound packaging is ensured through sustainable packaging design with 90% product to 10% packaging as the target efficiency ratio, sustainable production strategies, and sustainable transportation and end-of-life strategies. Convenient to carry, spill-proof, and easy-to-consume-from beverage packaging formats in the form of cans and downsized bottles, are becoming a major attraction on the supermarket shelves. Key players in the beverage packaging market are exploring beverage can and bottle formats for craft beers, coffees, teas, and even energy drinks. As per FMI’s analysis of the beverage packaging market, diversifying can sizes will remain an elected strategic option among manufacturers in the beverage packaging market—specifically targeting the younger demographic. Studies also indicate 150ml to 250ml slim cans gaining prominence over 330ml standard cans in the European beverage packaging market. Moreover, a lower price point and perfect choice for on-the-go consumption are key factors pushing sleeker can formats to the fore in the beverage packaging market. Other innovations in the beverage packaging market include front-of-bottle ingredients listing, transparent bottles with clear films, and a High Pressure Certified Seal by Cold Pressure Council. Manufactures in beverage packaging market are racing to differentiate themselves from rest of the brands—with Active and Intelligent Packaging (A&IP) as a key packaging technology. Moreover, a major driver of smart packaging in the global beverage packaging market is the increasing level of counterfeit beverages- mostly alcoholic, entering particularly in the Asian Markets. To overcome this situation, alcohol manufacturers are attaching smart tags on bottles as a part of smart beverage packaging to authenticate the content and indicate if its seal has been broken. For instance, Thinfilm Electronics’ fully printed NFC sensor tag called OpenSense is used by global drinks company Diageo. Agrindus—an Agribased venture in Brazil, is using A&IP to double the shelf life its pasteurized fresh whole milk by incorporating silver-based inert micro-particles having self-sterilization properties into the with bactericidal, antimicrobial and self-sterilizing properties into the polyethylene bottles through blow or injection molding. The on-demand aluminum chilling cans using patented liquefied CO2 to further activate the Heat Exchange Unit (HEU) by The Joseph Co. is a step ahead in smart packaging in beverage packaging market—opening new avenues for future innovations in beverage packaging. In FMI’s recently published market intelligence outlook on the global beverage packaging market, key players are projected to focus on product expansion through new product development and footprint expansion through strategic mergers and acquisitions. For instance, Crown Holdings, Inc to solidify its position in the South-East Asian beverage packaging market, opened a new manufacturing plant in Jakarta, in 2017—making it the 16th beverage can production plant in the Asia Pacific region. Another key leader in the global beverage packaging market, Ardagh Group acquired some metal beverage can assets of Ball Corporation and Rexam PLC—with facilities expanded in United States, Europe, and Brazil. Gerresheimer AG’s growth strategy circles around launching innovative products in the bottle packaging market. Why should you invest in this research study? A new report that throws light on the global beverage packaging market with a detailed historical performance study for the period 2012 to 2016 and a comprehensive revenue forecast for the period 2017 to 2027 has just been published by Future Market Insights. The report is a studied take on the global market for beverage packaging market and presents detailed revenue forecasts for the global as well as regional markets. There are several reasons why a calculated investment in this report will garner a noteworthy ROI for your business. These reasons are mentioned below. One of the key highlights of the report is our detailed analysis and recommendations on the global beverage packaging market. After studying the market extensively, our analysts have provided useful insights on the overall market approach; the product type, end user, and region to be targeted; and differentiating strategies of key market players to enable new entrants as well as existing market players to study and devise counter strategies to gain a competitive edge in the global beverage packaging market. 15.5.15. Mahmood Saeed Beverage Cans & Ends Industry Company Ltd.